Your Are Here: Home > Contact Us / Directions. Throughout the years many great explorers have searched for hidden treasures and gems, fear not, although we are a secret to be treasured we are easily found. Do not be fooled to thinking we are on the Fernwood Business site, that would be too obvious for the intrepid explorer. Just follow the directions below to find your way to the “little devil” himself, where he makes the magic happen, and produces the wickedly good frames. Leave the Town centre along the London Road and keep heading for the A1 South. 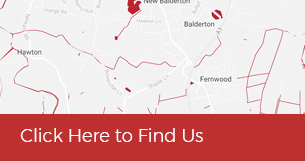 Once through Balderton, you will come to the major roundabout, Take the 2nd exit, signposted Fernwood, Grantham A 1 south and after you cross the bridge over the A1 you will be at the roundabout with the Tawny Owl Pub on your right. take the 1st Exit into the Fernwood Development. Follow the road take the 1st right into Plumb way. At the T Junction turn right again and follow the road past the Village Hall and the shops into the large carpark. Balderton Hall will be directly in front of you as you enter the carpark, just head to the small brown door 30 metres to the left of the main entrance and the "wickedly" good framer will be directly in front of you. Head South, from the A1 / A46 Junction and take the Balderton exit. You will then be at the roundabout with the Tawny Owl Pub on your right, take the 1st exit into the Fernwood Development. At the T Junction turn right again and follow the road past the Village Hall and the shops into the large carpark. Balderton Hall will be directly in front of you as you enter the carpark, just head to the small brown door 30 metres to the left of the main entrance and the "wickedly" good framer will be directly in front of you. Take the 1st exit signposted Balderton / Newark at the roundabout take the 1st exit signposted Fernwood, Grantham A 1 south and after you cross the bridge over the A1 you will be at the roundabout with the Tawny Owl Pub on your right, take the 1st exit into the Fernwood Development.